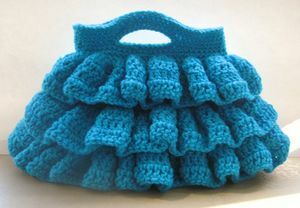 Sometimes you come across a pattern that just seems to call to you; this is what happened to me when I saw this delicious pattern for a ruffled bag, designed by the fantastic crochet pattern designer at CrochetDreamz. With her permission, I am honored to share the free crochet pattern with you here. Please visit CrochetDreamz for more stunning free patterns, as well as reasonably priced original designs for women and babies. You’ll be glad you went. 1. Worsted weight yarn ( size 4 Medium), also known as Afghan or Aran Yarn. I used color Aqua from Vanna’s choice. Around 510 Yards. I used 3 skeins of Vanna’s Choice. 13 inches wide at the base and 9 inches tall including the handle. It would be the size of an oversized clutch. Pattern is in standard American terms.US to UK conversion chart can be found online. 1. hdc2tog : [Yarn over, insert hook into next stitch and pull up a loop] twice to get 5 loops on the hook, yarn over and pull through all 5 loops on the hook. Note: hdc2tog is s decrease worked across two stitches joining two stitches in to one. 2. (hdc2tog) twice : This means that you do one hdc2tog across 2 stitches and then again you do one more hdc2tog across the next 2 stitches. So you would have made a total of 2 decreases one after the other. Note: The pictures are given at the top of each section. Please work from the written pattern and look up the pictures for reference when mentioned in the written pattern. 1. Work along the opposite side of foundation chain as shown by arrow. 2. Hook is inserted not into free loops of foundation chain but into gaps between sc. 3. A long oval formed after completion of round 1. 5. Mark 9 stitches in left corner symmetrically. 6. Right corner, do the same and work hdc2tog near the markers. 7. Shows how Round 9 is worked. 8. The slip stitch row shown enlarged. The row on top of the slip st round is Round 9. 9. Fold your work to insert hook into the slip st round. 10. 1st sc round of ruffle in to sl st.
11. Bag looks like this after first ruffle is made. 12. After second ruffle and a few more rounds. 13. After adding the third ruffle. Note: This bag is worked bottom up and you keep adding the ruffles as you go. The ruffles are started with a separate skein of yarn. A long oval is formed after round 1 as shown in pic 3 above. Your bag starts taking the shape of a long boat now as shown in Pic 4 above. Note: As long as you are making the correct number of decreases in each round, you may not really have to count the stitches at the end of each round. The body of the bag tapers upwards. Mark 9 stitches symmetrically in each corner as shown in pic 5 and 6 above. The decreases are worked near the markers. Mark 11 stitches symmetrically in each corner before the next round just like you did for Round 4. You will be working two hdc2tog near each marker. Round 9: Mark 11 stitches on both ends like before and Repeat Round 5 with 8 decreases but you work into the the hdc stitches of the round before the slip stitch round as shown in Pic 7 and 8 above. Now proceed to make the ruffle in to the slip stitch round. Note: You can fold your work as shown in pic 9 and 10 above to work the first round into the slip stitches comfortably. You can see the how your bag will look after first ruffle in pic 11 (above and at left). Proceed to make the Second Ruffle as follows. Note: You can fold your work as shown in pic 9 above to work the first round in to the slip stitches comfortably. You can see how your bag will look after adding second ruffle in pic 12 (above and at left). Proceed to Round 15 Below. Proceed to make the Third Ruffle as follows. Third Ruffle ( worked just like the first and second ruffle except the first round is a hdc round instead of sc). Note: You can fold your work as shown in pic 9 (above and left) to work the first round in to the slip stitches comfortably. You can see how your bag looks after adding 3rd ruffle in Pic 13 (above and right). 14. Measure 2 ¼ inches on each side and place markers as shown. 15. Chain 15 for handle when you reach the marker. 16. Work sc in to chain for bag handle. 17. Continue sc round as shown. 18. Work a slip st border around as shown. Switch to a G hook as you are going to start working the bag handle. Place markers for the bag handle. Lay your bag flat and measure 2¼ inches from both sides and place markers as shown in pic 14 above. My markers were 3½ inches apart. You will place on both sides of the bag for 2 handles. Round 22: Ch 1 ( not counted as a st), 1 sc in same st as ch 1, 1 sc in each stitch till the marked stitch, Ch 15, skip all the stitches between the markers, 1 sc in to the next marked stitch, 1 sc in each stitch till you reach the marked stitch on the other side of the bag, Ch 15, skip all the stitches between the markers, 1 sc in to the marked st, 1 sc in each stitch of the round , sl st to 1st sc; turn. See Pic 15 above for guidance. Round 23: ch 1 ( not counted as a stitch) , 1 sc in same st as ch 1, 1 sc in each stitch, when you reach the chain for the handle, 1 sc in to each chain as shown in pic 16, continue doing 1 sc in each stitch or chain for the full round as shown in pic 17 above, sl st to 1st sc; turn. Round 24 & 25: ch 1 ( not counted as a stitch) , 1 sc in same st as ch 1, 1 sc in each stitch of the round, sl st to 1st sc; turn. Round 26: Sl st in to the next st and each st around. This is to make the handle less stretchy and to give it a better finish. 1. Work a round of slip stitch around the handle as shown in pic 18 above and fasten off. 2. Weave in any tails remaining. About the Contributor: Crochet Dreamz is the creative crochet blog of a stay-at-home mom who started crocheting for the love of flowers and was hooked for life. You are free to sell items made from CrochetDreamz designs, but do not sell or distribute patterns without written permission of the author. Vist Crochet Dreamz for more free crochet designs as well as a lovely series of baby crochet patterns and women’s crochet patterns for sale at reasonable prices. Stay updated with new patterns by joining CrochetDreamz on Facebook.